A full running history of the Society is available HERE. It contains the founding events and officers, past and present details of the Society and County, and a list of annual awards and activities. Excerpts of our Official History are below. In 1975, a pressing need to form a county historical society was recognized by Dorothy Cosby and Helen Lawton, two retired schoolteachers. “Don’t you think we oughta do something about . . .” Dorothy began in her inimitable way. They gave a luncheon at the Cosby home, Tuesday, January 25, 1975 with Mr. Elie Weeks of Goochland County as a special guest to explain the details involved in getting a society started. Ten women from various areas of Powhatan County who had expressed an interest in forming such a society attended. Those present were Mesdames C. N. Elam, Charles Cella, Julian Binford, T. G. West, Louis Allen, J. G. Palmore, Taylor Smith, E. P. Hicks, C. F. Noble, and Miss Elizabeth Gills. 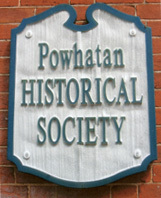 The Powhatan County Historical Society is dedicated to promoting the county’s unique past for present and future generations through collecting, preserving, educating, interpreting, and researching our local history. Our broadest and most compelling objective is to use the lessons of the past to improve the life and vitality with the Powhatan Community. This building is located behind the courthouse in the village of Powhatan. The first mention of a jail in the village of Scottville, as Powhatan was known, was in 1778. A notice appeared in the Virginia Gazette, in Williamsburg. From the records, it appears that prior to this time a log structure may have been constructed, or an existing one was used for a ‘gaol’. The Revolutionary War had taken most of the able-bodied men and there were not enough in the county to construct adequately a suitable building. The earlier building was replaced by the present structure and used as a jail for 150 years. In 1951, it was remodeled for use as an office building, and in 1994, it was again remodeled, for use by the Powhatan County Historical Society as a museum, library, and office. The present courthouse is Powhatan’s second, built on the original foundation in 1849. When the present Powhatan County was formed from Cumberland in 1777, the first session of the court was held in the Old Cumberland Courthouse, the home of Littlebury Mosby. It lies approximately 8 miles west of the courthouse on Route 60, and is known today as Mosby Tavern, the home of Dr. and Mrs. Donald Sanders. The present courthouse community was selected for its central location and was named Scottville in honor of General Charles Scott, an important figure in the American Revolution, who was born in what is now Powhatan. Records suggest that the first courthouse was poorly constructed, unsuited to the needs of the court. It was replaced by the stuccoed brick building designed by noted architect Alexander Jackson Davis, and featured a recessed portico accented by Doric columns, a courtroom balcony and enclosed balcony staircases, which can be seen today. This courthouse was renovated in 1992. The practice of presenting an award for outstanding private preservation was begun in 1982. Since that year, each succeeding president has made this award at the end of his/her term of office. Again, our full official history is here and we encourage you to partake!